My dad's name is Tim Humphreys and he was from Castro Valley, California. My dad grew up hunting with his father and grandfather. After losing his father when he was 16, he continued to hunt with his grandfather. He grew up hunting deer and hunted deer throughout my life. I never knew him to not go hunting! My entire life consisted of watching my dad prepare for his deer hunts every year with his hunting partner, and waiting on pins and needles until they returned home to find out if they had shot anything. I have so many great memories of those times. While I was in high school, my dad took up duck hunting and added to his hobby! It was at this time that I started to learn how to shoot shot guns and would shoot clays. I fell in love with shooting guns, but I never did any actual hunting with my dad. Tim Humphreys and Jerry Blake in Colorado, 2006. 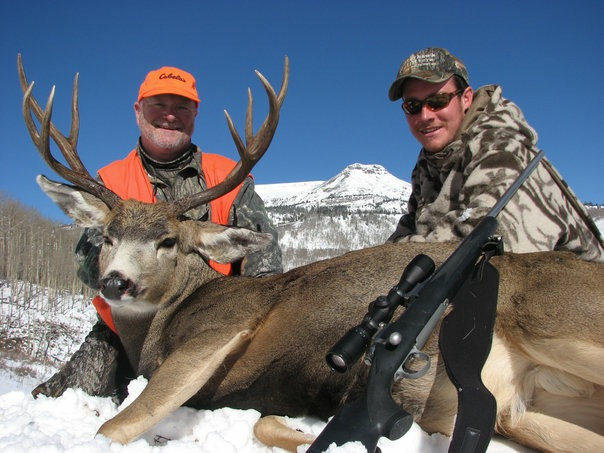 In 2006, my dad went on a guided hunting trip in Colorado. He was paired up with a young man named Jerry Blake. On this trip my dad shot a mule deer and made such a connection with Jerry that they kept in touch every year. My dad's dream was to hunt with Jerry again one day. Two years ago, my dad had both of his knees replaced and my mom secretly contacted Jerry to purchase a guided hunt with him once again. 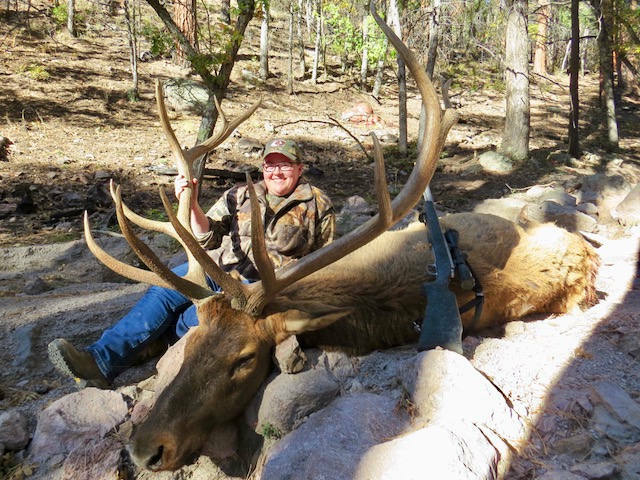 Jerry had started an outfitter named Love of the Hunt Outfitters (LOH Outfitters) and for Christmas of 2016, we surprised my dad with his guided hunt with Jerry in New Mexico. My dad was elated!!! He immediately contacted Jerry to find out everything he needed to know!! In the spring they put in for the dates and unit for a tag, and my dad was chosen! Jerry was honestly surprised he had pulled a tag! This hunt was meant to be! My dad purchased a brand new Remington Ultimate 50 caliber Muzzleloader and was working with Jerry on bullets and powder and getting all the supplies together. He and I had even mapped out what highways he was going to take, where he could stop and get gas based on his fuel tank, and how fast he could get there. My dad was a fuel tanker driver and was used to driving, so he knew he could make it quickly! My dad was so excited about this trip! Unfortunately, my dad passed away suddenly on Tuesday May 30th, and the Lord took him home to be with Him in Heaven. I called Jerry to let him know and he said he would call me back later to discuss what to do about the hunt. A few weeks later, my mom received an email from Jerry stating that he had really been looking forward to hunting with Tim again this year. Jerry asked if there was anyone special we would want to transfer my dad's elk tag to and hunt with him to pass on my dad's legacy. I immediately told my mom I wanted to do it. I had no idea what I was doing, but really wanted to do this in honor of my dad. My mom emailed Jerry back and said it was a long shot, but that I wanted to go. Jerry immediately responded and stated he would absolutely love to take me and help and teach me as we went. He had no doubt in his mind that I could do it! Thus, the planning began! I spent a weekend in September with my dad's hunting partner as he helped me sight in the gun. My dad had never had a chance to shoot it. We were the first ones. After a few practice shots on my part, his partner said he wasn't worried about me going on this trip anymore. I had a pretty accurate shot! I knew I was my daddy's daughter! Sadly, the Remington bullets that came with the gun were really a struggle to use and Jerry had me get in contact with Bob Parker of Parker Bullets. Mr. Parker set me up with his Parker 250 Ballistic Extreme bullets with 150 grains of Blackhorn 209 powder. I was so grateful for his help! October came and it was time for my trip. 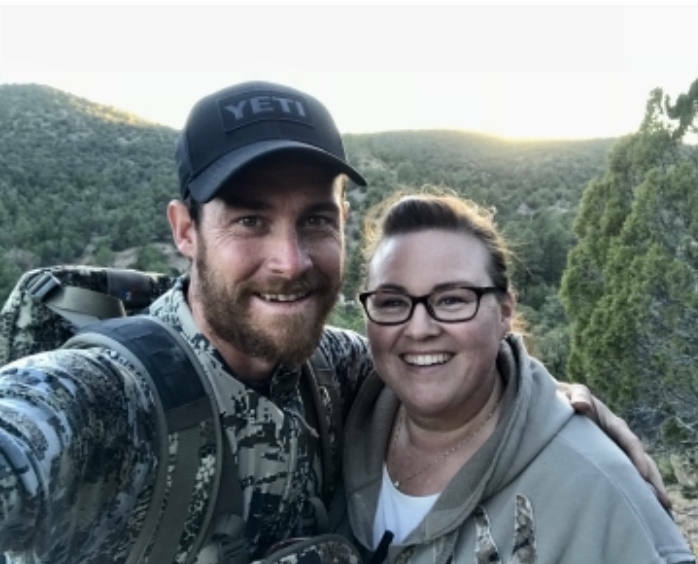 My hunt was Saturday October 21st - Wednesday October 25th out of Magdalena, New Mexico. I was hunting in unit 17. What an amazing week it was honoring my dad and what he loved to do! I flew in early and spent Friday with Jerry and his family. Getting to know the man my dad had made such a friendship with was absolutely wonderful. Jerry took me to the range to make sure my gun was still sighted in correctly after traveling. It was there I met the gentleman who would be my guide for the week. I had the most amazing guide I could have ever been paired up with in Andres Trujillo. Jerry couldn’t have picked a better guide for me. As this being my very first hunting trip, I had no idea what to expect. Andres was so encouraging and never got discouraged with me. He and I laughed so much, that even when we weren’t hunting we were having a blast! After Jerry and Andres sighted in my gun, and figured out my scope markings, they had me practice. I took one shot and both Jerry and Andres said they weren't worried about me; that I wouldn't have any problems getting a bull that week! Once again, a testament to my dad! The first day of my hunt Andres hiked me back into a major canyon, up and down steep mountain sides and lots of rocks. We got within 120 yards of an elk, but the wind shifted as we got closer and he winded us and ran off. I was sad and knew that was part of hunting, but that also meant I had to hike back out of that canyon with nothing. I literally thought I wasn't going to make it back out! But Andres, Jerry, and Andres’ little brother Vicente Trujillo were so patient with me and we made our trek out. Andres said he was so proud of what I had accomplished that day and that I had gone further in than most hunters he’s guided. He said he saw a fight in me that he knew I was up for anything! That fight was for my dad! The second day brought a lot of driving around and scouting because I was SO sore from the day before. I got to see a lot more of the NM wilderness, which was beautiful. I enjoyed that time! The afternoon took us to the other side of the mountain we were on on Saturday. We went to one hill and glassed for a while, but the couple of bulls Andres saw were too far in for us to get to, both due to time of day and what I was capable of hiking. That evening Andres glassed from one of his favorite spots and we saw some bulls, but it was too late to try and get them. We decided we would go back in the morning on the third day and see if we could find them again! As we returned to the glassing lookout the next morning, unfortunately the bulls were gone. We drove all the way around the mountain looking, but nothing. The third day was a bit rough for me emotionally. I was really missing my dad and not wanting to let him down. I was feeling like I was going to fail and I needed to change my focus. I told Andres how I was feeling and he knew just what to say to perk me up! We returned to the spot we had seen the bulls the evening before and just started scouting again. As we drove around the mountain, all of a sudden Andres stopped in the road and spotted an elk. He asked if I wanted to go for it and I jumped at the opportunity! We literally ran down the mountain to get to him because it was getting dark. My little legs had a hard time keeping up with Andres’ experienced and longer stride, but I made it. We made it down to the spot Andres had last seen the bull, but he wasn’t there. Andres could hear him, but not see him. He got me set up in a position on a rock (which was perfect for me to shoot from as I had only ever shot standing up) about 150 yards across a canyon and we waited. It was getting dark so we needed the bull to come out of the trees. Andres threw rocks and cow called to get him to come out. As he was coming out of the trees, I couldn’t find him in my scope and Andres literally took my arms and shoulders and set me up. I finally found him in my scope and was trying to shoot. I was so shaky, and Andres kept prodding, “You have to shoot. You have to shoot.” Andres made one last cow call causing the elk to look my direction. I took three big breaths and shot. I looked at Andres right away to see if I had hit him and the look on his face was priceless! He took the gun from me, I looked back quickly and saw the bull falling to the ground. He rolled almost to the bottom of the canyon. I turned around again and Andres just hugged me because I was shaking so badly from all the adrenaline. I looked at Andres’ face again and he was beaming. He said, “You smoked him! I’m so proud of you!” And he hugged me again. Andres said I hit him in the left shoulder and the bullet traveled and hit him in his back, dropping him in his tracks! What an amazing feeling that was! After climbing back out in the dark, we headed back to the elk camp at the ranch and everyone was there to greet and congratulate me. It was such an awesome feeling! I wish Jerry could have been with us again, but he was waiting at the ranch for me and was so proud of me! It was like my dad was with us and he was hunting with him again! Due to the time of day I shot my bull, we were up early the next morning to head back in to pack my elk out. Andres’ friend Carlos Valenzuela came with us to help. We rode ATVs in to the canyon as far as we could and then hiked in another ½ mile. Andres was so excited for me to see the bull after teasing me all morning about its size! (He had gone back the night before to gut him and saw how large the elk was.) When I saw it, I was shocked! I didn’t know what to do! He kept telling me to touch him and once again he had to help me! Hahaha! We then took a slew of pictures before they started skinning and quartering the bull. That process was amazing to watch. All that they had to do was crazy. I apologized for not helping and said my dad would have been right in the middle helping, but I wasn't there yet! Maybe next year! And then to watch them pack it up and carry it out to the ATVs. WOW! It took them two trips it was so heavy! My elk steaks are on their way to me as we speak! I have never had elk steaks before. When I was in New Mexico, I had elk bologna and elk sausage which was very yummy!! We are having him mounted chest up. My dad would have had him mounted, and I wanted to do the same in his honor. This was such an AMAZING trip and I can't wait to go back. The weather was beautiful and I saw some gorgeous sunrises and sunsets! 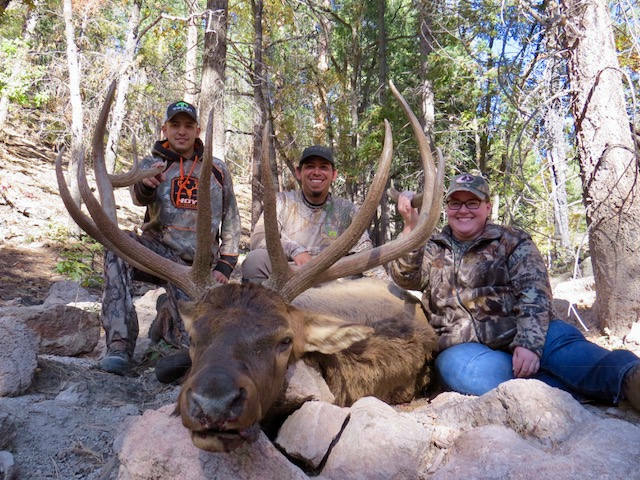 I'm already planning to return to New Mexico and hunt with them once again in October of 2018!!! Jerry and Andres can't wait!